Months before the 2012 election, Nate Silver of the New York Times predicted the eventual outcomes of both the Presidential and all open Senate elections with great accuracy- not just who won and lost, but the percentages of the vote as well. Is it possible for litigation professionals to estimate the financial value of lawsuits using a method and tools similar to those Nate Silver used to predict the election? The development of good metrics and analytics is a key aspect of the strategies for achieving both objectives. 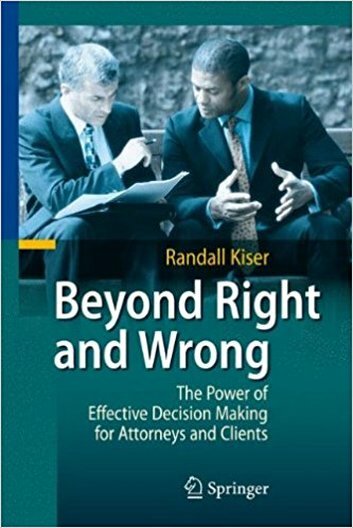 Beyond Right and Wrong by Randall Kiser is one of the most important contributions to litigation practice in years. Read our review and listen to an interview with Randy Kiser. Or simply take our word for it, click on the picture below, and get your own copy. If you're serious about achieving excellence in litigation, you won't regret studying Beyond Right & Wrong.